President Lungu says he will not allow media institutions to ruin the peace the country has enjoyed for many years. Meanwhile, Media Institute of Southern Africa (MISA) Zambia chapter vice-chairperson Hyde Hagunta has called for transparency in the process of enacting the Access to Information Bill. 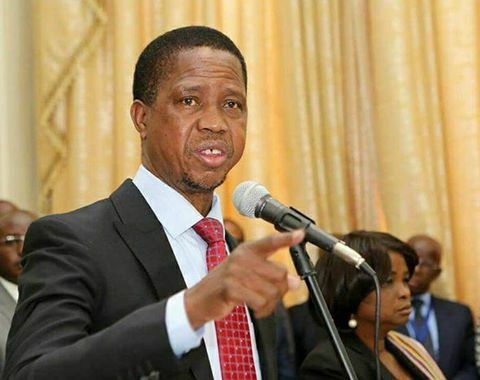 Speaking when he met the leadership of the Zambia Congress of Trade Unions (ZCTU) at State House, President Lungu said that Prime TV was inciting people to rise against the government when they reported about the violence that characterised the Sesheke parliamentary by-election last month. The Head of State supported the Independent Broadcasting Authority decision to suspend the operating licence for Prime TV saying the authority followed the right procedure. And President Lungu said that there is no sincerity in the fight against corruption because only politicians are perceived to be corrupt. He said the fight against corruption can only become a reality if all stakeholders were involved. Speaking earlier, ZCTU President Chishimba Nkole expressed concern at the country’s high debt obligation which is affecting salaries for civil servants. Meanwhile, Haguta says his organization also expects that the approved Bill will this time around be enacted and operationalised. Speaking at a media briefing held in Lusaka on Tuesday, Haguta also urged Members of Parliament to debate the bill in the interest of the Zambian people above their own. Haguta has further called on the government to take due democratic process in enacting Cyber laws by making the process as transparent as possible. “MISA expects government to engage stakeholders before enacting these laws,” he said. Meanwhile, Northern Province Minister Brian Mundubile has described the approval of the Access to Information Bill by cabinet as a milestone as it would improve information flow and media operations in the nation. He was however quick to advise media practitioners to ensure that they uphold professionalism in their day to day duties. Mundubile said this when he inspected progress at the Zambia National Broadcasting Corporation (ZNBC) provincial studios in Kasama being constructed by Star Times. Meanwhile, Zambia Institute of Independent Media Alliance (ZIIMA) President Jajah Coulibaly said there was nothing to celebrate about the announcement of the bill being approved by cabinet as it was not the first time this piece of legislation had been enacted. Coulibaly said that ZIIMA is of the view that government is still playing games with the issue of the Bill and his association would only accept it when it was finally enacted. Information and broadcasting Minister and Chief Government spokesperson Dora Siliya announced through twitter that Cabinet has approved the Access to Information Bill, aimed at proactive and organized dissemination of information to the public and described it as a new beginning. But Coulibaly said that government has, for a number of years now, been making these pronouncements and statements of approval without actualizing a stakeholder driven ATI Bill.